When choosing the best toys for 5 year old girls, you need to remember that your little girl is all grown up and ready for kindergarten! She’s adventurous, ready for new challenges and eager to learn. Her personality is shining through and she will come into her own when she starts school and begins a new chapter in her young life. She will become more aware of the types of toys her new kindergarten friends are playing with and will want to play with them too. She will need toys that allow her to be imaginative and creative as well as toys that challenge her and allow her to explore all sides of her personality. Our top picks for the best toys for a 5 year old girl are designed to foster your child’s independence and adventurous nature, encouraging her to explore and try new things. We’ve worked hard to ensure our hand-picked list of top toys combine adventure, excitement, fun and learning! If your 5 year old girl loves collecting cute Shopkins characters, then she is going to be thrilled with the Shopkins Supermarket Playset. This adorable playset comes with a shopping cart, 2 exclusive Shopkins characters, a moving belt at the check out counter, a chute for your child’s characters to slide down, and other store related items. The idea behind Shopkins is for children to collect over 100 super cute characters that can be found in shopping bags of all places! As well as collecting the characters, children collect the Shopkins playsets which they can connect together to create a large shopping mall. There are lots of different Shopkins themes to keep your little girl interested and engaged. The playsets have interactive and movable features to make it even more fun for your girl. Girls have wonderful fun with these super cute characters and playsets, and they encourage them to engage in imaginative and pretend play. A great toy for helping children to engage in storytelling, which is very helpful for essay writing in school in later years. They love trying to collect every single character, even the elusive Ultra Rare ones, to add to and build upon their existing collection. This playset provides your little princess with hours of fun. It is also suitable for boys, some of whom really love this set. Great idea for a birthday or Christmas gift. 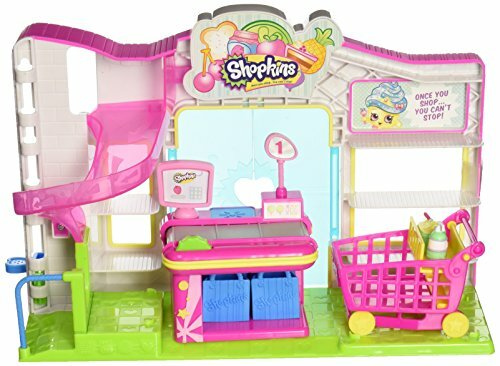 Some Moms have readily admitted that they have had just as much fun playing with this Shopkins Small Mart Supermarket Playset as their children did! Children really love the moving belt and letting their Shopkins characters slide down the deliver chute! Watch your five year old little girl’s nurturing and caring skills come to the fore when she holds this beautiful, realisticLa Newborn 14″ African American Real Girl Doll from JC Toys! Her face will light up with joy as she holds this gorgeous baby doll in her arms and hums her favorite lullaby. This life-like doll is sure to turn heads when your girl is out in the park or mall carrying her or pushing her in a stroller because she looks so real. Hand created by renowned designer Salvador Berenguer, this doll is anatomically correct with real features such as cute baby wrinkles, soft vinyl skin, eyes that shine and glisten and realistic expressions. Each La Newborn doll comes with a number of accessories to enhance your child’s experience. These include a birth certificate, a realistic hospital ID bracelet, a reusable cloth diaper, and hospital belly button gauze. Her arms, head and legs all move, much to the delight of children who love playing with this stunning African American Girl Doll. When it comes to choosing the perfect real life baby doll for your child, there are a number of choices available: African American Real Girl Doll (featured), African American Real Boy Doll, Asian Real Girl Doll, Asian Real Boy Doll, First Day Real Girl Doll, First Day Real Boy Doll, First Tear Real Girl Doll, First Tear Real Boy Doll and First Yawn Real Boy Doll. Of course your little girl may want to start collecting these dolls for each birthday or Christmas, to create her very own little ‘pretend’ family. Can’t you just picture your child and her friends happily playing ‘Mom’ with this wonderful life like baby doll? This gorgeous African American Real Girl Doll can serve a purpose beyond imaginative play. If your little one is an only child or the youngest child, and about to become a big sister, the transition can be difficult. Introducing your 5 year old child to this lovely JC Toys La Newborn Life Like Baby Doll to care for, will help her to transition into her new role of ‘older sibling’. It will also allow her to shower her baby with affection and love. This Boutique La Newborn 14 Inch Life Like Girl is the perfect baby doll for any boy or girl to learn what nurturing a younger sibling is like. Made of washable vinyl, she is easy to keep clean and fresh, and several parents said that preemie clothes and diapers fit quite well. The Kidzlane Kids Play Dishes come in a 29 piece set with a dish strainer and is perfect for 5 year old girls who love to party and wash up afterwards. This eye catching dish set has 4 complete place settings that come in 4 gender neutral bright primary colors. Each set includes plates, cups, bowls and cutlery, all made from food safe BPA Free plastic. What’s wonderful about this gorgeous Kidzlane Dish Set is that it’s made to be as realistic as possible to look just like the dishes adults use. 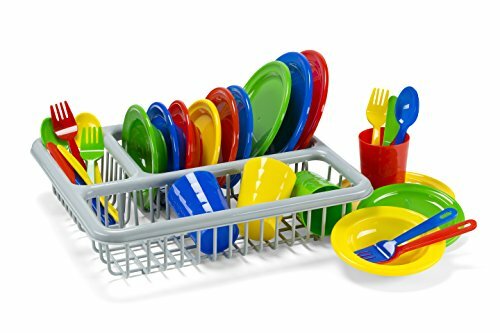 If your child already has a play kitchen, then this colorful dish set would be a nice addition to it. These dishes are the ideal size for tiny hands to manipulate and play with. Your child will spend hours playing with these Kidzlane Play Dishes, cooking imaginary ‘meals’, serving them up for their guests, which could be their dollies, teddy bears, siblings, friends or other family members. And when the ‘meal’ is over, they will enjoy washing them and stacking them on the drainer. They are totally suitable for indoor and outdoor play as they are quite durable and can withstand a lot. A very popular birthday present for grandkids everywhere, this colorful dish set is a huge hit with kids, including boys as well as girls. Your child will have hours of fun with these play dishes, and even more so when playing with siblings or friends! Your little girl is going to love this Melissa And Doug Slice And Bake Cookie Set as it allows her to enter the world of imaginary baking! The joy she will get from pretending to bake the 12 sliceable wooden cookies, adding her choice of the 12 vanilla and chocolate frosted toppings included and serving them to you and other family members is just priceless. To add to the baking fun, this beautiful set includes a wooden knife, spatula, cookie sheet and kitchen mitt. The cookies come in an eye-catching cardboard tube that’s designed to look like a real tube of cookie dough. When your little girl opens the tube, all 12 cookies will come out as one long roll. They are being held together using velcro. This is so that your child can have the fun experience of ‘cutting’ the cookie dough with their toy knife to create the cookies. As they move the toy knife through the velcro strip, it makes a nice crunching sound to add to the excitement! One she is done slicing the cookie dough, your little girl can place the cookies on the cookie sheet so that she can pretend to cook them. If she has a play kitchen with an oven, or even a toy cooker, then she will enjoy the added fun of putting the cookie sheet in the oven. Once her wonderful cookie creations are ready, your child can use the kitchen mitt to hold the ‘hot’ sheet. Now she’s ready to start decorating her lovely cookies with the 12 frosted toppings. These will attach nicely to the cookies using velcro. This is a fantastic toy for any girl or boy who loves the imaginary world of play kitchens, cooking and baking. Your littel princess will enjoy endless hours of fun with this very durable cookie baking set. 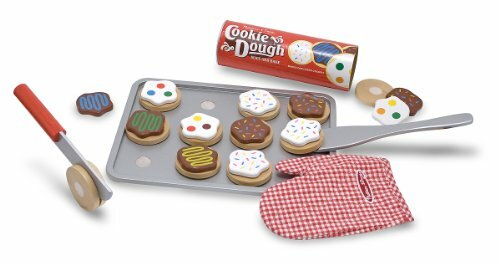 First and foremost, this wonderful slice and bake cookie set is a whole lot of fun for any child! If your little girl is like a lot of 5 year olds, then she’ll love this arts and crafts Creativity For Kids Fashion Headbands toy! At this age, children really enjoy making things they can actually play with or use, which is why this headbands arts and crafts set is a huge hit with most girls. 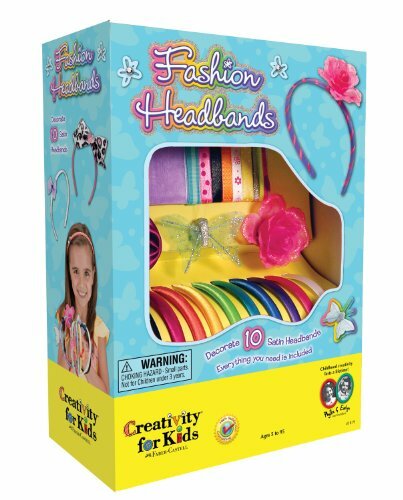 This fashion headbands craft kit comes with enough supplies to create 10 gorgeous headbands and includes the satin headbands in a rainbow of colors, ribbons, flowers, feathers, rhinestones and more. Now you’re probably wondering how comfortable these headbands actually are? The good news, based on feedback from parents, is that they are soft and quite comfy, but more importantly, they don’t pinch behind the ears and sit nicely in place. This Creative Fashion Headbands Kit comes with detailed instructions and lots of design ideas for your child. Your child will get 2 large flowers and a butterfly on elastic bands so that she can attach them easily to her newly designed headband. Everything your child will need to create beautiful hair accessories is included, with the exception of a scissors. This is a wonderful arts and crafts set to encourage your little girl to explore her creative side and express herself through her own ideas and creations. Lots of fun for your budding designer! So, your little five year old girl would love to have her very own pet, but as her parent, you feel she’s not quite ready for that level of responsibilty but feel for her. Well, the Little Live Pets S3 Cleverkeet just might be the perfect solution! This cute as a button bird is a fantastic interactive toy that helps your child get a feel for what it’s like to own your very own pet. Cleverkeet is a an amazing, singing, talking bird that your child will absolutely love and adore! From swinging on his perch to riding his very own cart, Cleverkeet will respond to your child’s voice, and learn new words. Your little girl can take him for a walk using his perch or placing him on her little finger, or she can put him on his cart and watch him ride it. If she plays her favorite music, then Cleverkeet will dance to it! She can give Cleverkeet a name she really like so that he truly is her very own pet. She can pet him and chat away to him, while he chats back and copies some of the things she says! Owning and playing with Cleverkeet will bring out your child’s nurturing skills. 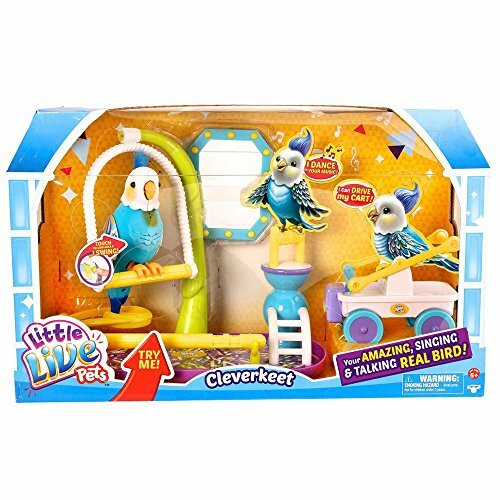 Cleverkeet operates on 2 AA batteries, and the set includes the bird, playground for the bird, and and instruction booklet. Kids love the fact that this cute bird can repeat what they say, chat with them, sing, dance, swing and ride a cart! Your child will love the fact that the bird moves his head and wings, “eats”, talks to himself when looking into the mirror and so much more! Butterflies seem to hold a fascination for people of all ages, from small children to adults. So how cool would it be for your 5 year old to watch a butterfly develop from caterpillar to the beautiful winged creature we all know and love? That is exactly what this Insect Lore Original Butterfly Garden With Voucher allows your child to do! What a wonderful introduction to science for your five year old, giving them a memorable opportunity to raise and feed their very own butterflies. So how does it work? Your child will receive an 11.5 inch tall mesh habitat that pops up and is reusable in the Insect Lore Original Butterfly Garden kit. This is for viewing and feeding their butterflies before letting them go. 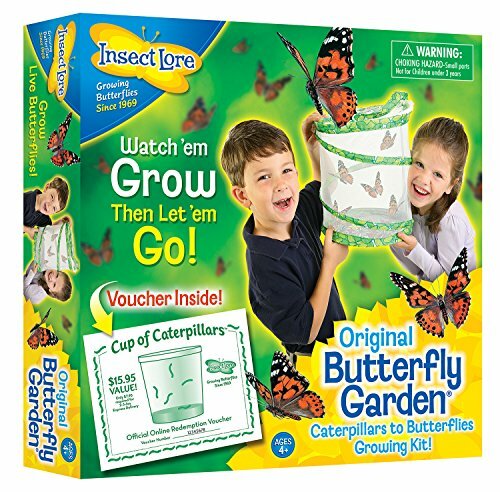 Included in the kit is a voucher than can be redeemed for a cup of caterpillars that are shipped separately. Also included is a feeding pipette with instructions on how to feed the butterflies. When your child redeems the voucher, they will receive a plastic cup containing 5 live caterpillars with food to keep them nourished. The caterpillars stay in the cup, away from direct sunlight, and will feed on the food and grow to about 10 times their original size! After about 7 to 10 days, they will start hanging upside down. They will harden and turn into what’s called chrysalides. Your little girl gently removes the chrysalides and places them in the pop up butterfly habitat. Then it’s a matter of waiting another 7 to 10 days for them to turn into Painted Lady butterflies. The excitement your child will have watching the chrysalides every chance she gets to see if the butterflies have arrived will be incredible! Once the butterflies finally arrive, your little girl will learn how to feed them using the pipette. She can enjoy them for a few days, before releasing them and letting them go. Perfect for young children to learn how butterflies develop and the changes they go through, this butterfly garden is a great gift idea for birthdays and Christmas. Your child learns how to feed butterflies which is an awesome experience! Most kids love music, and your little five year old girl is probably no exception! Finding the right musical toy for her though can be a challenge. She’s at that age where the usual run of the mill musical toys won’t hold her interest as well. That’s why we’ve chosen the Lyons 25-Note Xylophone (Glockenspiel) With Case which is one of the most beautiful musical instruments ever. It is 15 ½ inches long and 8 ¾ inches wide, comes in a built-in case with plastic mallets and is perfect for children. This is a wonderful instrument for your little girl to learn how to play music. It produces a lovely sound and is in tune. Now while the plastic mallets are more than adequate for your child starting off, several parents said that switching to rubber mallets makes the sound a whole lot better. Easy to carry and take to music class or even when travelling. 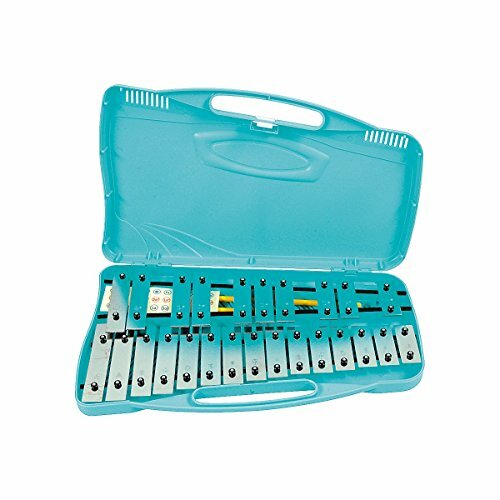 Children absolutely love this Glockenspiel Xylophone and have great fun creating their own tunes. The perfect gift for any music loving 5 year old! 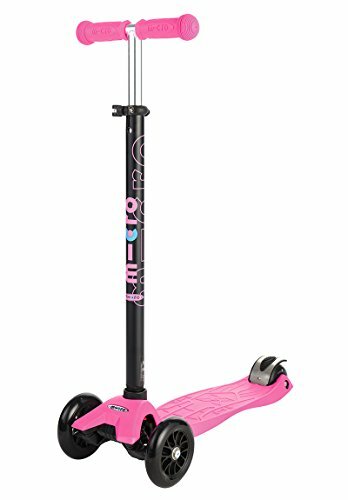 If your 5 year old loves to ride, then she is going to absolutely love zooming along on the Micro Maxi Kick Scooter with T-bar in gorgeous girly pink! This beautiful scooter has a curving and carving action. What that means is that your child can use it like a skateboard to surf the sidewalk. The handlebar is designed to give your child greater control and help them maneuver the scooter better. Smoothness is name of the game when it comes to the Micro Maxi Scooter as it’s designed to absorb any bumps in the sidewalk. Your child leans into whatever way they want the scooter to go, which helps them going around bends safely and smoothly, as well as turning and changing direction. It is incredibly well made, safety certified by the CPSC, and has won a number of prestigious awards. It is very flexible as you can adjust the handlebar from 24 to 34 inches to suit your child. Extremely lightweight and portable, you can literally take this scooter anywhere and for a lot of kids, it becomes their main source of transportation. They scoot everywhere and really enjoy it! If their siblings and friends have Micro Maxi scooters, they will enjoy racing each other and going off on their own wonderful adventures. The scooter does have a brake which is located over the rear wheel. Basically all your child has to do is use their foot to engage the brake. The Micro Maxi Kick Scooter comes in several different colors, but pink seems to be the most popular color for younger girls. It’s suitable for anyone weighing 110 pounds or less. Kids love scooting on the Maxi and find it great fun! This Peg Perego Polaris Outlaw Quad comes in a bright pink color that is perfect for little girls who have a wonderful sense of adventure! Your little princess will thoroughly enjoy riding around on what can only be described as the most eye-catching ride for girls who want to have fun. Children love the sporty look and feel of this all terrain vehicle which is made in the USA at Fort Wayne. The well designed and detailed decals add to the overall beauty of this gorgeous quad. 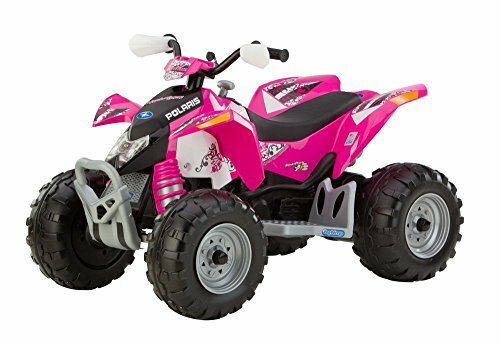 A girly quad for off-road fun, your 5 year old will have an absolute blast driving this vehicle on all types of different terrains, enjoying all kinds of adventures. The Polaris Outlaw has 2 speeds – 2 ½ and 5 mph – as well as reverse. There is a high speed lockout so your little one won’t be going fast until you are sure they are ready. The low gear is perfect for you to walk alongside your little girl while she rides her quad in the park. This quad runs on grass, dirt, gravel and pavement. It has a weight capacity of 85 pounds and comes with an accelerator pedal, automatic brakes, a 12-volt battery, a charger and stickers. Fantastic fun quad for your little girl who will have an absolute blast riding it!